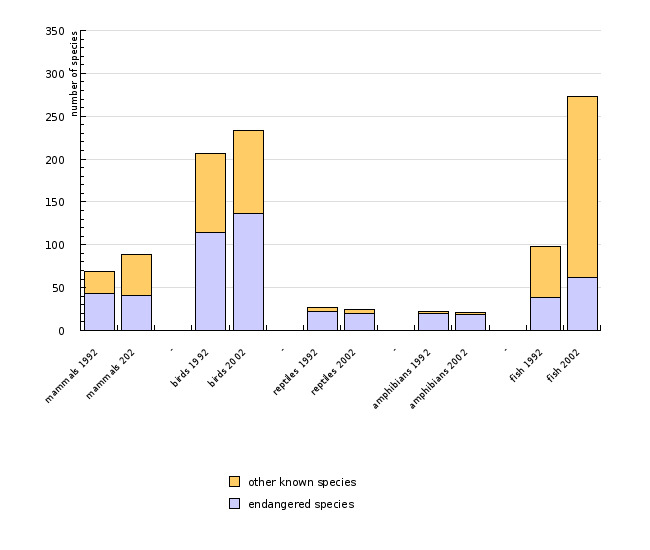 This indicator shows the number of threatened species by individual systematic group in Slovenia. International comparability is limited as a consequence of the introduction of new criteria for including species into categories of threat by the International Union for Conservation of Nature (IUCN) in 1994. Old criteria have been applied in the Rules on the inclusion of endangered plant and animal species in the Red List since 2002. Varstvo narave, Rdeči seznam ogroženih praprotnic in semenk SR Slovenije [Nature Conservation, Red List of endangered vascular cryptograms and phanerograms in the SR of Slovenia], No. 14/15, 1989, Rules on the inclusion of endangered plant and animal species in the Red List (OG of the RS, No. 82/2002), Mala flora Slovenije: Praprotnice in semenke [Slovenian flora in brief: vascular cryptograms and phanerograms], 1984. To preserve a high level of biodiversity and to halt the decline of biodiversity by 2010. To maintain or achieve a favourable state of threatened species and habitat types. Slovenia is renowned for its great biodiversity. It is estimated that there are approximately 13,000–5,000 animal species, as well as more than 3,200 higher plant species in Slovenia. This indicator represents only a rough estimate of the numbers of species. Changes in trends cannot be assessed, as the amount of all known species in Slovenia in the years 1992 and 2002 differs because of new scientific findings and not due to an actual variation in the number of species. 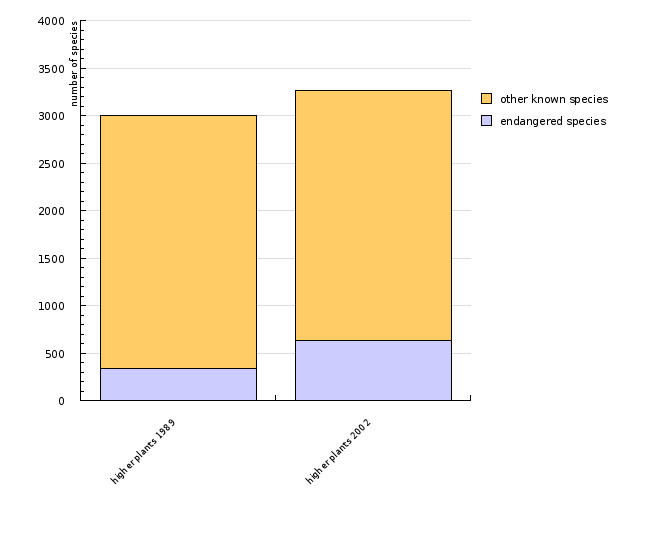 The same goes for the number of threatened species. A threatened species is a plant or animal species whose abundance is determined as decreasing to such an extent that the species may disappear in part or all of its range. There are several categories of threat: endangered species are directly threatened, the existence of vulnerable species depends on the existence of their ecosystem, while rare species are only potentially endangered. An endangered species is a species that is at risk of extinction should the endangerment continue. It is a species whose abundance has fallen to a critical level and is decreasing extremely rapidly. Endangered species include the following: the Great Pasque flower (Pulsatilla grandis), the brown bear (Ursus arctos), the Eurasian eagle owl (Bubo bubo), the sand lizard (Lacerta agilis) and the fire-bellied toad (Bombina bombina). A vulnerable species is a species whose abundance has been on the decrease or has decreased in a large part of its range. Vulnerable species settle in areas very sensitive to human impact. They include the following: the Blagay’s daphne (Daphne blagayana), the wildcat (Felis silvestris), the goshawk (Accipiter gentilis), the long-nosed viper (Vipera ammodytes) and the European green toad (Bufo viridis). A rare species is a potentially endangered species due to its rarity. If threatened, the species can quickly progress into the endangered species category. Rare species include the following: the bay laurel (Laurus nobilis), the Brandt’s bat (Myotis brandtii), the carrion crow (Corvus corone corone), the green turtle (Chelonia mydas) and the black proteus (Proteus anguinus parkelj). The data are based upon a regulation which has been compiled on the grounds of external scientific expert studies. The list includes species, in some cases subspecies as well. When new data concerning endangerment become available, it would be reasonable to revise the regulation according to the new IUCN criteria. A monitoring system has not yet been prescribed. The National Programme of Environmental Protection foresees a revision of the Red List of Endangered Species by 2008. Rules on the inclusion of endangered plant and animal species in the Red List, OG of the RS, No. 82/2002, Environmental Agency of the Republic of Slovenia. Varstvo narave, Rdeči seznami ogroženih živalskih vrst v Sloveniji [Nature Conservation, Red List of endangered animal species in Slovenia], No. 17, 1992, Environmental Agency of the Republic of Slovenia. Varstvo narave, Rdeči seznam ogroženih praprotnic in semenk SR Slovenije[Nature Conservation, Red List of endangered vascular cryptograms and phanerograms in the SR of Slovenia], No. 14/15, 1989, Environmental Agency of the Republic of Slovenia. Martinčič A., Sušnik F., Ravnikar V., Strgar V., Wraber T., Praprotnik N.: Mala flora Slovenije: Praprotnice in semenke [Slovenian flora in brief: vascular cryptograms and phanerograms], DZS, 1984. Pregled stanja biotske raznovrstnosti in krajinske pestrosti v Sloveniji [Review of biodiversity and landscape diversity in Slovenia], Environmental Agency of the Republic of Slovenia, 2001.